The biggest star Liverpool ever signed – "Play Up, Liverpool"
Announcement that Liverpool F.C. 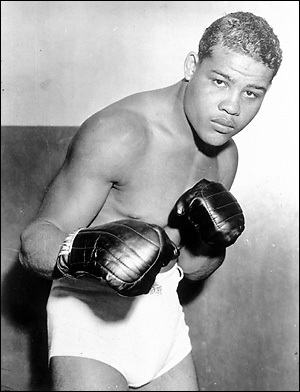 are to tour America next May means they are to revisit the land of the biggest star they ever signed – Joseph L. Barrow (Joe Louis to you). Joe signed for Liverpool when he visited Anfield as a U.S. Army sergeant in 1943. Manager George Kay asked Joe to put his autograph on a piece of paper. When Joe had done so, Mr. Kay informed the champ he had contracted to play for the Reds. Liverpool rated Joe as a first-class sport. And the English club created a similar impression on their goodwill visit to the States last year. Playing under floodlight conditions, they won all ten matches and delighted the U.S. spectators. Hence the return invitation.